Join a Bible study or personal enrichment group! Bible study groups are a wonderful and transformative way to go deeper into God's word, to enhance your understanding of the world around us while fortifying your faith. At First UMC Coral Gables, we are proud to have a wonderful assortment of bible study groups nurtured by insightful and caring members of our church family. Below are some of the groups you may join today! Sunday Mornings: Trinity Bible Study Class - "The Origins of Scripture"
Join the Trinity Class as we look at the origins of our Bible traditions. Reading from Richard Friedman’s “Who Wrote the Bible?” and Fr. Richard Rohr’s “The Bible and Jesus,” we explore the historical and religious roots of our scriptures. How is the Bible “the Word of God” for us in our lives? How did it come to be written? Free copies of “Who Wrote the Bible?” and study guides are available! Join us Sunday mornings for this eye-opening exploration. The only thing missing is you! Families are at the heart of everything we do! Join us as we support each other, sharing knowledge, advice, and love! Pizza, refreshments, and childcare are always provided, as are listening ears and caring hearts! Join us, we would love to spend time with you! On Hiatus - Typically meets rirst Sunday of the month, from 12:00 p.m. - 2:00 p.m.
Join us every Sunday evening, from 7:00 p.m.-9:00 p.m., in the Head Center as we bring to life "Letters of Paul: The Heart of Christianity." Paul's missionary journeys and letters to young churches brought Jesus Christ out of the Jewish closet in Jerusalem and into the whole Roman empire. To Paul, Jesus represented the beginning of a new age, a time of throwing aside narrow beliefs and the burden of sin, and embracing the freedom to live fully in relationship with God, no matter what you may have believed before. Join Dr. Bob Ladner as we kick off with an introduction to Paul's life and theology. Details and study guides available from Dr. Bob Ladner at ladner_r@bellsouth.net. When: Every Sunday night at 7:00 p.m.
Join us for an insightful series on Monday evenings, at 7:00 p.m. in Room 215, as we discuss Deborah, a strong-minded and God-fearing woman who was a prophetess, judge and poetess. Meet Monday evenings, from 7:15 p.m.-8:15 p.m.
"The Great Spiritual Migration" Discussion Group Taking Flight Now! Join Dr. Margaret Cox for a new thought-provoking discussion series based on the book, "The Great Migration" by Brian McLaren. 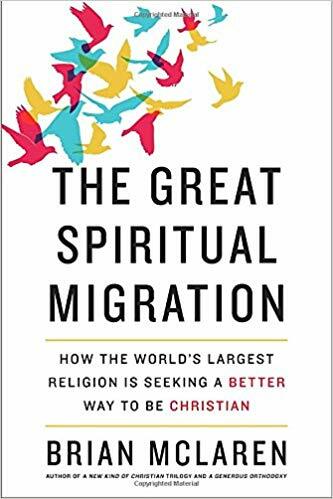 Centered on the book's premise that Christianity is embarking on a once-in-an-era spiritual shift, our discussion group invites our church family and friends - long-time or new - to come together in a judgment-free zone to explore our individual and cumulative spiritual journey. Breaking from the old stereotypes that have distanced believers from our faith where God is shown full of wrath and vengeance, the Discussion Group focuses on the idea that our God is the renewing Spirit at work in our world for the common good. His followers are called to re-dedicate ourselves to healing the planet, building peace, overcoming poverty and injustice, and collaborating with other faiths to ensure a better tomorrow for all of us. Click here for a special interview with author Brian McLaren, by The Florida Conference of the United Methodist Church. The book club reads and discusses books on contemporary social issues -all while having a wonderful time together! Don't miss these special gatherings! The Group will be focusing on various books throughout the year. Please contact the Church Office for the latest details. Typically meet every third Tuesday of every month, at 12:30 p.m. The Gospel of John is the most deeply spiritual of the four gospels. This writing is filled with rich images and profound truths, but John notes that his aim in writing the gospel is that readers will not only believe in Jesus Christ, but that they “may have life in his name. Adults, youth, and children alike can experience a season of spiritual growth and life-changing renewal in Adam Hamilton's "John: The Gospel of Light and Life. You'll follow the life, ministry, death, and resurrection of Jesus through the Gospel of John and understand the context of some of the best-known verses in the New Testament. When: Typically meet Wednesdays, 9:15 a.m. Contact: Pat Brown | (305) 778-2632 or click here for more details. Get your weekend started off the right way by joining us on Friday mornings, at 9:30 a.m. in Room 225. Hear from some of the most well-known Christians in history about how God speaks to them-and discover for yourself how you can discern the voice of God. This warm group of friends is waiting to spend time with you! Contact: Click here for more details. Are you ready to unleash your inner Piccaso? A great masterpiece might be within you and this class - taught by Teresa Brooks - can bring out your talent! Bring a canvas, paints and your imagination. Every Tuesday, from 2:00 p.m. - 4:00 p.m. Contact: Teresa Brooks | Contact Church Office at (305) 445-2578. Alcoholics Anonynous' "Miami Young People's Group"
FUMCCG is proud to announce its newest ministry, partnering with Alcoholics Anonymous' (A.A.) "Miami Young People's Group." Focusing on a "12 Steps & 12 Traditions" program, this caring support group offers hope and help to families and friends of alcoholics. If you or someone you know needs help or would like more information, please contact Peter Pinney at (786) 239-7577. To learn more about A.A. and the 12 Step program, please visit www.aa.org. Every Tuesday, at 7:30 p.m.
Wednesday Night Fellowship Grand Finale April 3! Please join us as Dr. Bob Gower and Ms. Lindsey Jones conduct and direct the Calvary Chamber Orchestra and Chorus in a production of Vivaldi’s “Gloria”! The concert will begin at 7:00 p.m. on Wednesday April 3, 2019 after the Fellowship meal. Serving for this love-offering meal will begin at 5:30 p.m. and service will finish at 6:45 p.m. The meal and the concert will be held in Founders Hall. Childcare will be provided for each session, with participants needing to pre-register by calling the Church Office at (305) 445-2578. For more information, please contact Ed Baker at baker.edward@comcast.net. Stay connected to your FUMCCG for more updates and a stronger you! Wednesdays, from 5:30 p.m.-7:30 p.m. Contact: Ed Baker | baker.edward@comcast.net. The power of prayer is a powerful force in our lives! Join us for our special monthly Prayer Breakfast, as we help lift each other up in a program full of inspiration and insightful speakers. ON HIATUS: typically meet 2nd Wednesday of each month, from 7:30 a.m. - 8:30 a.m. Contact: Bobby Bryant | Click here for more information. Interested in sewing seeds of love? Want to learn an amazing new talent or use your abilities for good? Then join the We Care Quilters as they knit quilts for wounded veterans, foster children, babies and disaster victims. Love is stitched here daily! Every Wednesday, from 9:00 a.m. - 12:00 p.m. Contact: Jay Brooks | Click here for more information. Loss of a loved one, economic security, health concerns and life's challenges severely changes one's life. The Grief Support Group is here to walk with you. This loving group is a reflective and interactive group, helping those in need of transition by connecting to each other and to the heart of God. Wherever you are in your grief journey, you are welcome here. Looking to develop some wonderful friendships and engage in great conversation? Interested in the perfect lunchtime getaway? Then look no further than our Silver Club! Join us every week for entertaining programs, great fun and a delicious lunch - all for only $5. You never know what great things are on the menu so be sure not to miss out! Typically meet every Thursday at 10:30 a.m. Hot breakfast and warm friendships are on the menu for this men-only get-together. Engaging speakers and lively discussions are always brewing here so come spend some time with us! The Second Saturday of the month, beginning at 8:30 a.m.
Congratulations to our very own First Coral Gables Organization/ Unit of United Methodist Women for officially receiving their Certificate of Re-Organization on January 6, 2019! For 150 years, United Methodist Women have organized laywoman and mobilized for God's global mission of the church and our church family can continue writing the next exciting chapter at FUMCCG! Join us select Sunday mornings and learn how you can contribute to being the loving and positive change that we would like to see in the world! Ready to take the next step forward? We'd love to walk with you! We have a diverse group of small groups, each offering something very special and tailored to you! Contact Rev. Phillip Short at 305-445-2578, or via email at pshort@fumccg.org to help you find the perfect group for you. Don't walk through life's journey alone, walk with your FUMCCG family! For more information on current small groups and how to connect with one that speaks to you, please contact Rev. Phillip Short at pshort@fumccg.org.